Duke is the 1 seed in the South Region, and they also feature the potential #1 pick in the 2015 NBA Draft in Jahlil Okafor. But it will be the play of Tyus Jones and Quinn Cook in the backcourt that allows Duke to play Kentucky in the NCAA Championship game. However, they have to go through either Gonzaga or Iowa State to reach the Final Four first. Led by Kentucky transfer Kyle Wiltjer, the Zags will have to play through the state of Iowa before matching up with Duke in the Elite 8. Iowa will get the Bulldogs in the Round of 32 should they take care of Davidson, but they are no match for Gonzaga. It's Iowa State the Bulldogs have to be weary of. The Cyclones score 78.4 points per game and feature 5 guys in double figures, and another who scores 9.6 points per game. Georges Niang leads the Cyclones in scoring at 15.5 points per game and he, along with Monte Morris and Dustin Hogue, all shoot better than 40% from downtown! They can beat anyone, on any given night. The South is going to feature plenty of high scoring affairs that make for great television, but when all is said in done, Jahlil Okafor will prove that he is the best player in the county and solidify his status as the #1 pick in the 2015 NBA Draft. 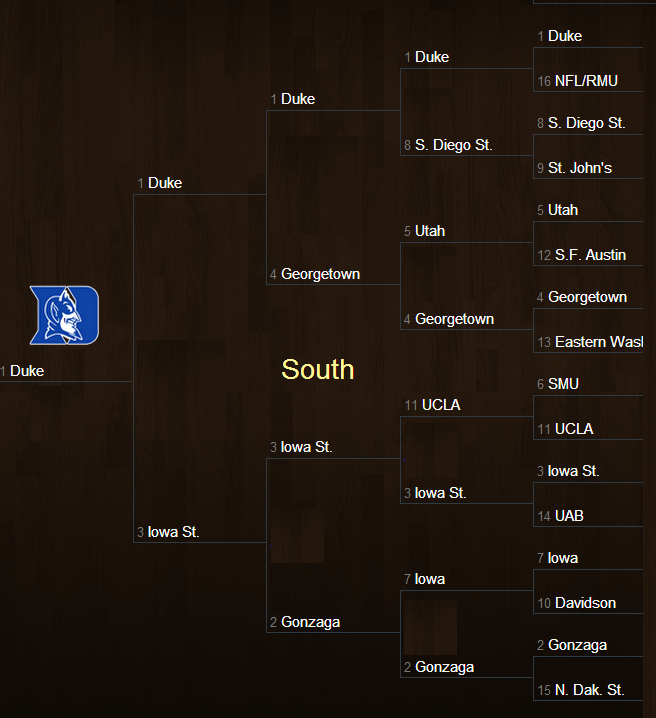 Should the Hoyas somehow figure out how to beat Duke, 53.7% of brackets would lose a final four team!